Our family goes back and forth making apple pie and apple crisp during apple season and Thanksgiving. Both are loved, and both are appreciated. Personally, I prefer the apple crisp because that granola (crisp) topping is just to die for. I prefer to leave out the sugar and flour because I truly believe they are not necessary. Instead, oats, nuts, seeds, and coconut oil is mixed with some spices, and that is it! The apple “filling” is just apples, cinnamon, and lemon. 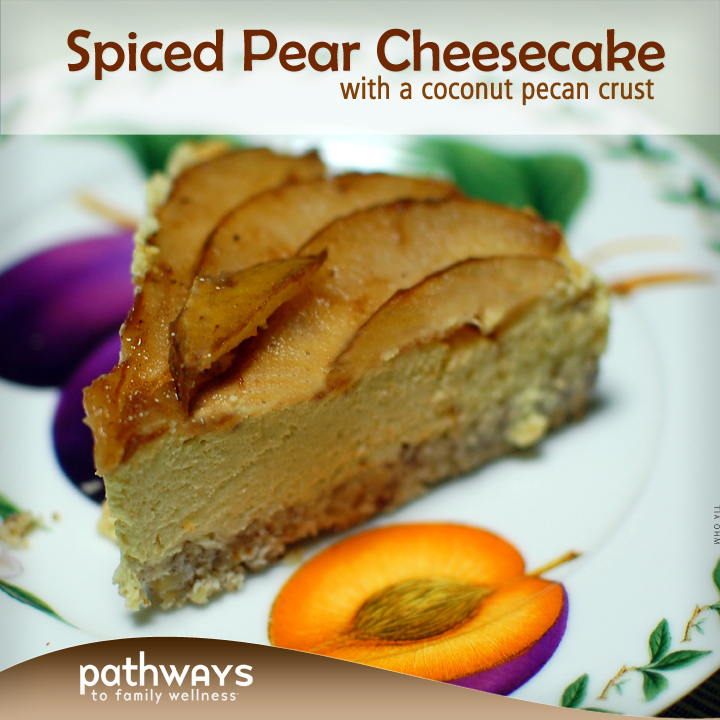 The sweetness of the apple comes out once baked, so there is no need to sweeten this at all either. In fact, if you try it, you may be pleasantly surprised that the only reason you’ve been sweetening the recipe is because you always have, and assumed, always will. But really, we don’t need it. We don’t want it! We are satisfied without the added sugar, and our bodies will be all the more happy for it. In my mind, if something is sugar-free it is breakfast worthy. So yes, I ate this for breakfast. And no, I don’t feel bad about it. Just some cooked apple with homemade granola and yogurt. It was absolutely delicious, and I would do it again in a heartbeat. I believe you will enjoy it, sans sugar, for breakfast or dessert. The choice is yours. 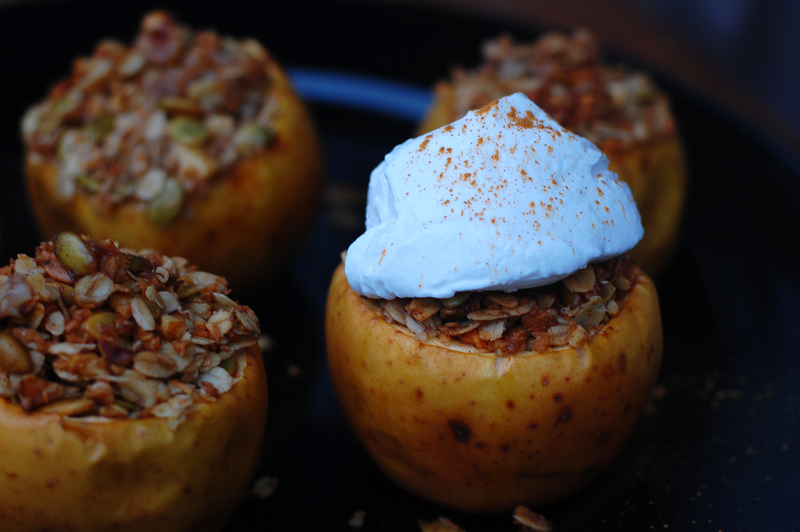 To be perfectly honest, I first made this recipe thinking it would be an easy alternative to apple crisp. I cannot say that is the case. The coring of the apple takes a bit of extra effort; trying to core it just right, discarding the seeds and tough bits while saving the good stuff. That process alone took me about 10-15 minutes , and I only made 5 apples. So perhaps the reason to make this recipe is not for simplicity, but for fun! 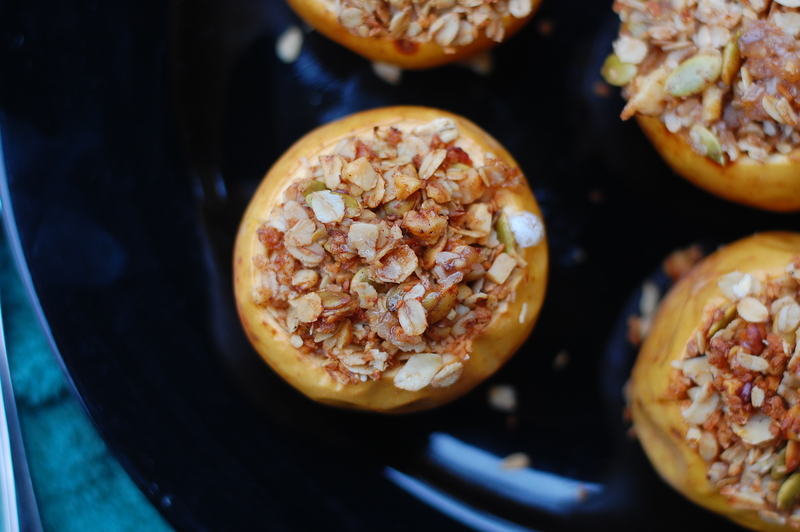 I had never tried a stuffed apple before, have you? Something deep down is satisfied with the eating of a whole fruit [almost] intact as if just plucked from the tree. I believe this allows you to appreciate the origin of the meal more fully. Simply one apple per person will do the trick. No more, no less. And that, to me, is simplicity at it’s finest. Another reason to love this recipe is because the skin of the apple in tact. This is something I believe we can all appreciate because the skin is where all the good stuff is. The skin holds most of the nutrients, so why in the world get rid of it? 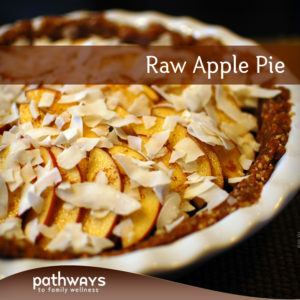 In a traditional apple crisp or apple pie, the apples are peeled and discarded leaving you only with the sweet pulpy contents. Here, we left the skin, and enjoyed that bit of texture with each bite. 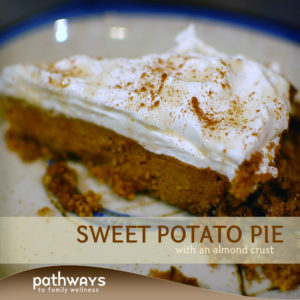 Whether you are interested in trying something new for Thanksgiving, want a fun breakfast option to try, or simply looking for a refined sugar-free dessert option, this recipe is worth your time and effort. Begin by preparing your apples: cut about 1/2 inch off the tops, and core them without cutting through the bottom. Use a paring knife to cut a nice big circle out of the middle, leaving about 1/4-1/2 inch on the edges. Scoop out the core and contents with a spoon. You will have some good apple here so don’t throw it all away! 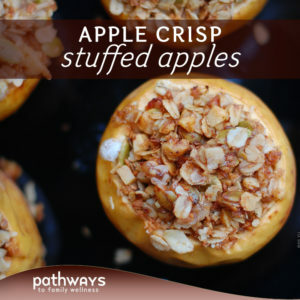 Cut around the core, saving the good bits of apple and adding to a bowl, and discard the seeds and core bits. Repeat with all the apples. You should have enough good apple chunks to refill the apples. 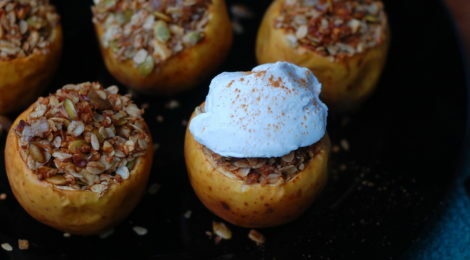 Take your bowl of good apple bits and combine with 1/8 tsp ground cinnamon and 1/2 tsp lemon juice. Mix. Fill your cored apples with the spiced apple mixture. Prep your crisp topping by mixing together oats, walnuts, pumpkin seeds, coconut flakes, coconut oil, the rest of the cinnamon (1/4 tsp), nutmeg, vanilla, and sea salt. Make sure the oil is well incorporated and everything is mixed nicely. 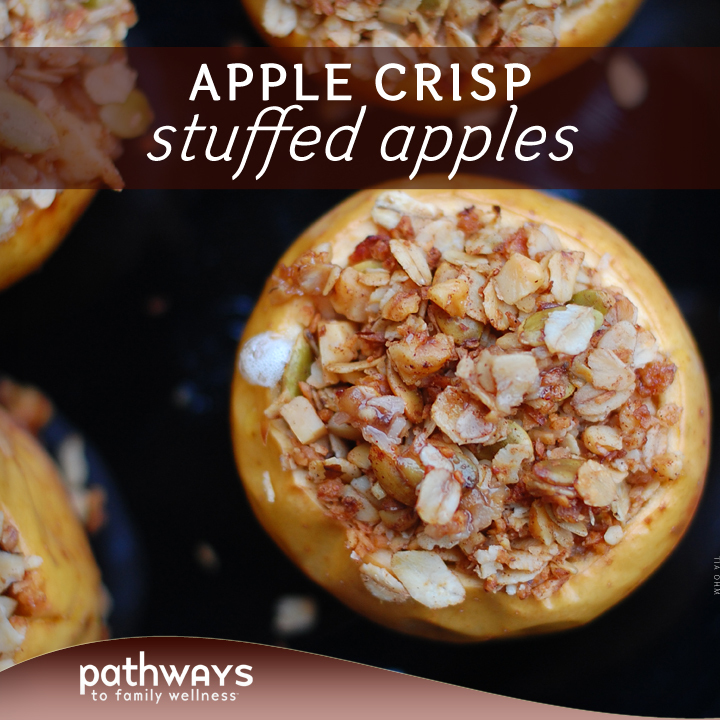 Top your apples with the crisp mixture evenly distributing between all of them, packing down the contents. 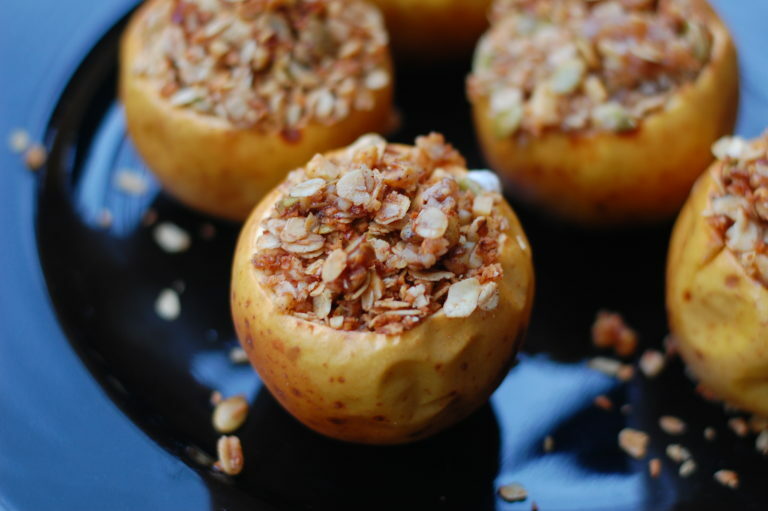 Place apples in a glass baking dish. Add 1/2 cup water to the bottom (this will keep the apples moist so they don’t dry out). Bake at 350° for 45 minutes to 1 hour, or until the apples are soft and the crisp is golden brown. Enjoy topped with yogurt, cream, whipped cream, or ice cream and a light sprinkle of cinnamon.